2019 is looking to be the year of the waterfowl gun and a very big year for Retay Arms of Konya, Turkey. 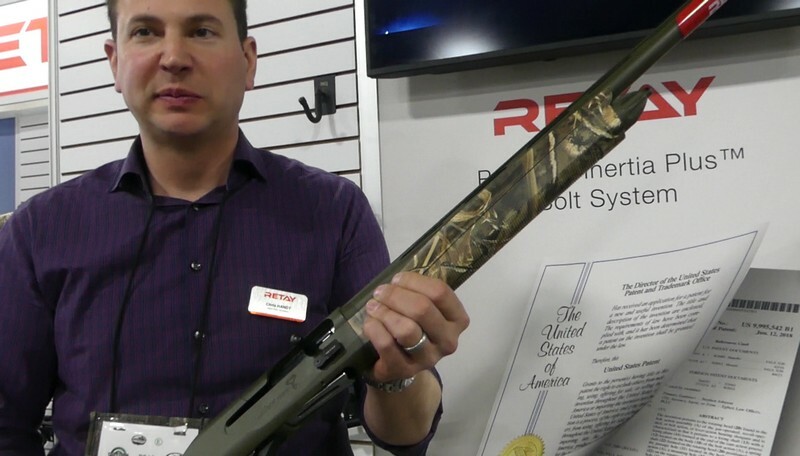 At the SHOT Show in Las Vegas last month, Retay Arms introduced their 3-1/2 inch chambered Waterfowler. For years, inertia “waterfowl” shotguns have been in a coma, not showing much in the way of innovation, just getting a bit uglier and more expensive every year. Beretta's Benelli brand has been among the worst offenders, offering little more than worthless gimmicks in exchange for rip-off level pricing. The Super Black Eagle 3 is as good of an example as any. A camo SBE has a starting list price of $1899. For that, it still lacks features that duck hunters want: an extended charging handle, an over-sized bolt release, Cerakote options, and so forth. The SBE3 also quickly gained a nasty reputation for not shooting where you point it, shooting unacceptably high and to the left. If you do want a fully-featured SBE3, you can start by grabbing your wallet and screaming. Yes, it is available, Benelli calls it their “Performance Shop SBE3 – Waterfowl,” and the rip-off of what some call the “Redneck Rolex” has never burned brighter: https://www.benelliusa.com/performance-shop/performance-shop-sbe-3-waterfowl-shotgun . There it is, “Starting Price $3199” according to Benelli, a price that could only be concocted by an intoxicated marketing department completely out of touch with the world. I suppose you do get what you pay for, and if you buy insanely overpriced plastic shotguns, then that is what you get. Shooting a Retay Masai Mara 3-1/2 inch Waterfowler, I found it to be ridiculously soft-shooting with 1-1/8 oz. lead loads, quite comfortable with fast 3 inch Black Cloud shells, and yes . . . unpleasant to shoot with 3-1/2 inch shells, like most everything under eight pounds. The Masai Mara has a barrel made from Bohler Steel, like all Masai Mara shotguns, it has the same envelope dimensions as the 3 inch MM shotguns, and the same excellent balance and swing. The 3-1/2 Masai Mara Waterfowler has no-click Inertia Plus action proven in the 3 inch Retay models, with beefed up springs to handle heavy loads without issues. The MM 3-1/2 inch Waterfowler retains the machined alloy quick-release trigger guard array as before, along with a machined easily removable ejector. However, the 3-1/2 Waterfowler adds another Retay Arms innovation, speed unloading of the tubular magazine with just an outward push on the over-sized bolt release. No other shotgun has this system which will make any hunter happy. The minimum advertised price for the top-of-the-line Cerakote / camo 3-1/2 inch model is $1200. This gun not only puts all other inertia guns on the market to shame, it shames them even further on price. The Browning A5 3.5 inch Wicked Wing, for example, retails for $1999 and lacks the over-sized bolt release, the Retay Speed unloading, the push-button release trigger, and on and on. The Retay Masai Mara 3.5 inch Waterfowler weighs about 7-1/4 lbs., about half a pound more than the 3 inch guns, yet hardly overweight for a 3-1/2 inch chambered shotgun. It comes complete with a hard case, five choke tubes, adjustment shims, etc., and as always . . . the Retay Five Year Warranty is handled in the United States by Briley. For those who want extended choke tubes, Trulock Chokes, https://trulockchokes.com/ , has them in stock. The Retay 3-1/2 Waterfowler is available in 26, 28, and 30 barrel lengths. I expect to have a 26 inch barrel Waterfowler here in a month or so. The 2019 Retays have already been shipped, so widespread availability should be within 4-6 weeks unless there is another government shutdown to slow things up. Above: Chris Handy of Retay USA exhibits the new Masai Mara Waterfowler. The Retay 3-1/2 inch Waterfowler is the shotgun destined to put Retay on the map in the United States in a big way for 2019. This model makes all the other inertia shotguns out there either insultingly overpriced, or severely lacking in features . . . for that is exactly what they are. When you can fly First Class for $1200 or a tad less, there is no reason to spend more for any inertia gun and sadly end up with less. Any FFL can order Retay product through their distributors and several dealers are already Retay-direct stocking dealers. There is much more to follow when my Retay Waterfowler hits the door.